Rainfall in May was extremely low: The third lowest amount ever recorded. Rivers are responding differently depending upon whether they received water from rain or snow, which is melting rapidly. With projected drier and warmer conditions, can the remaining snowpack maintain healthy streamflows this summer? Seawater is already getting saltier than normal in response to the lack of rain. We see algal blooms in many colors. What is that orange stuff out there? It’s a Noctiluca bloom and organic material drifting at the surface stretching from South to Central Sound and Whidbey Basin. Description Rainfall in May was extremely low: the third lowest amount ever recorded. Rivers are responding differently depending upon whether they received water from rain or snow, which is melting rapidly. With projected dryer and warmer conditions, can the remaining snowpack maintain healthy streamflows this summer? Seawater is already getting saltier than normal in response to the lack of rain. We see algal blooms in many colors. What is that orange stuff out there? 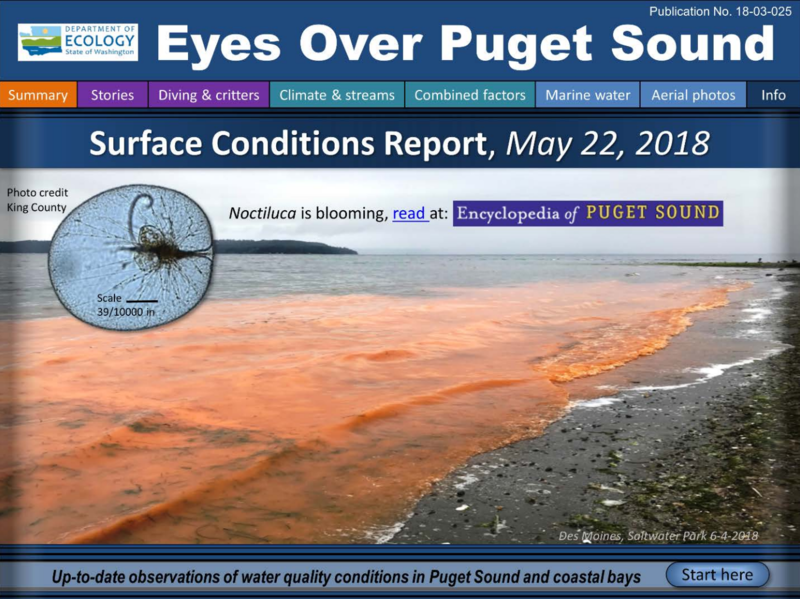 It’s a Noctiluca bloom and organic material drifting at the surface stretching from South to Central Sound and Whidbey Basin.